The photographs and article you see here were written and submitted by Anandi Mal. Readers can submit articles whenever they’d like by using the Submit An Article link in the menu. 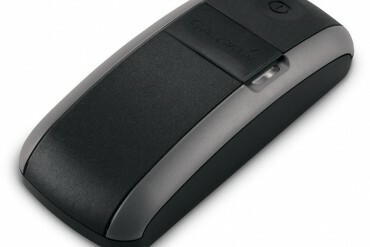 Anandi Mal is a freelancer from West Bengal, India. She has interests in photography and aspires to learn more and develop a vision for photography. She loves to go places and also loves to write about anything she feels like is most amazing. 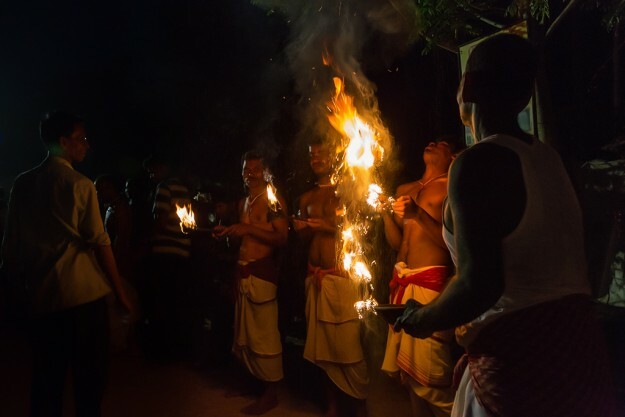 Here she tries her hand at photographing moments of an Indian festival. One of the many charms of India lies in its festivals and their celebrations. 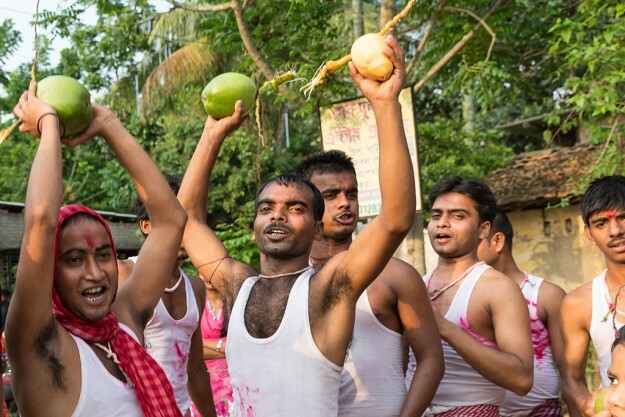 Religious ceremonies, rituals and practices and devotion to faith make each festival a colorful and unique celebration. Quirkiness apart, what drew Anandi to document this typical Indian festival is its tremendous human element and their spontaneous expressions. Here she strives to present a visual story in words and colors. India Charak Festival is held in mid April throughout Bengal. 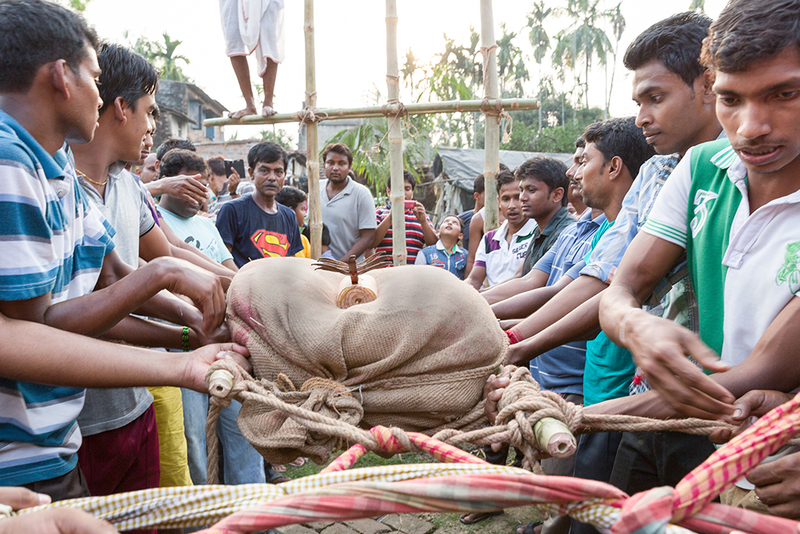 It is a traditional Bengali festival that marks the Bengali year ending and also the end of Gajan and Neel Puja. 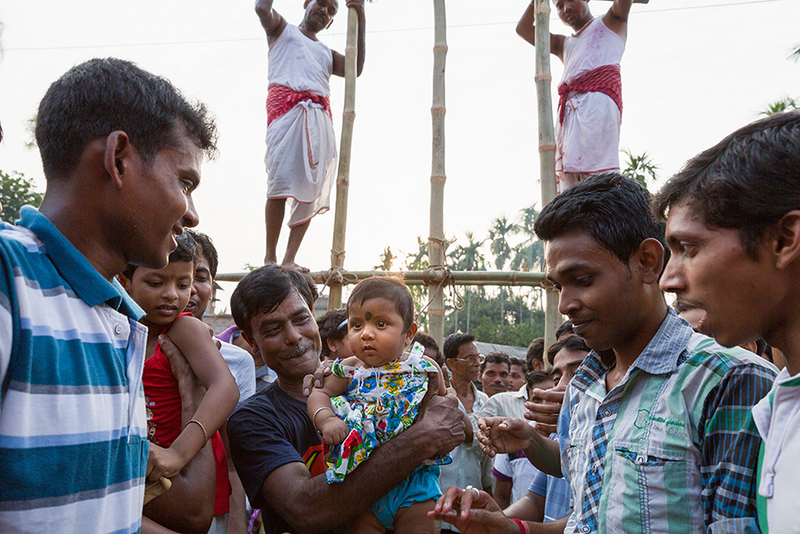 Devotees of Lord Shiva fast for an entire month to follow the rituals of this festival. The mendicants or the Gajan Sanyasis live on alms and fruits collected from various households. 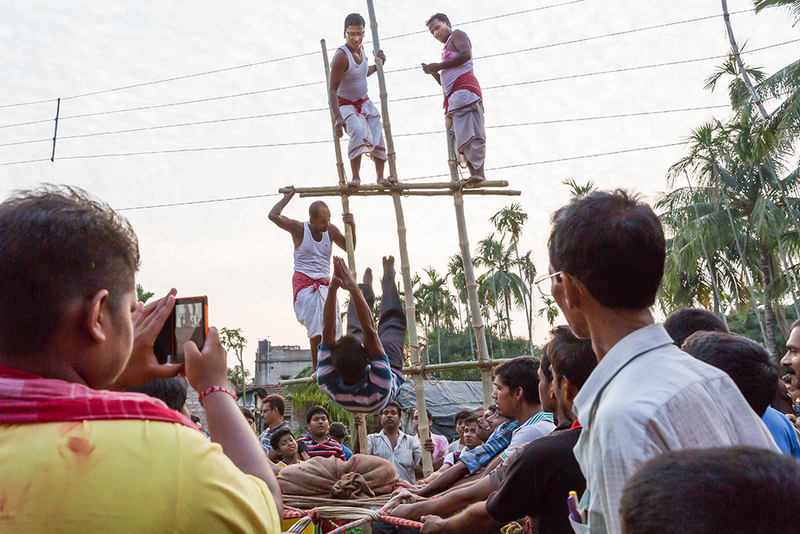 On the day of Charak, they perform perilous acrobatics to honor the Shiv-shakti or the Supreme Power. 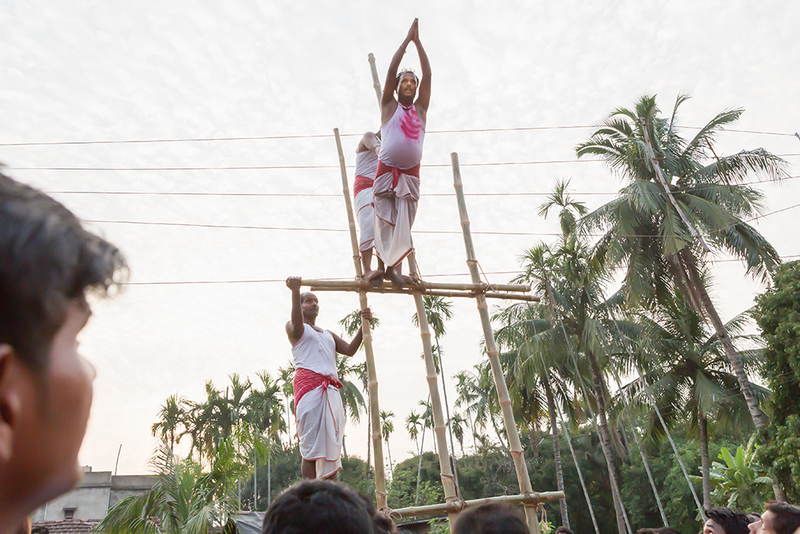 The festival is held on an open ground close to a Shiva temple. It becomes late evening for the rituals to begin. A bamboo stage almost fifteen feet in height is built upon bamboo poles. It is really overwhelming to watch the devotees climbing the bamboo stage and thrusting them forward upon a blade placed over a sack covering. The crowd rejoices as soon as a devotee lands onto the sack unscathed. Newborns are also laid on the sack for divine blessings. 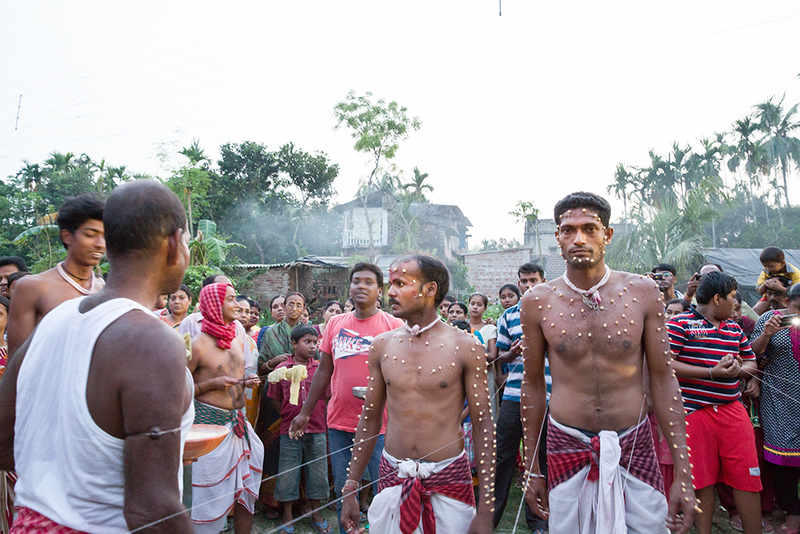 The ritual of body piercing pursues after the Jhap or the diving ceremony. 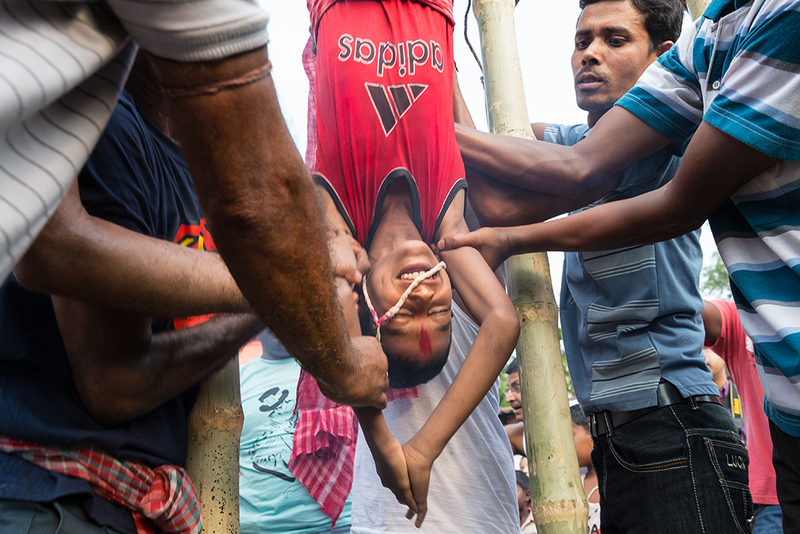 The face and the upper limbs of the devotees are pierced with large pins. Sacred threads are inserted from their waists. The threads are then pulled in and out in rhythms to make the performers jig on the beats of Dhak . As darkness descends, the monks begin fire dancing encircling the temple. It is really astounding to observe how blind faith and rituals inspire folks to commit such daring acts, for they believe this is the path to achieve salvation. Do you have a story to tell? We’d love to read it. PhotolisticLife is visited by over 50,000 viewers each month from all over the world. Give us a glimpse of your world by submitting an article here.